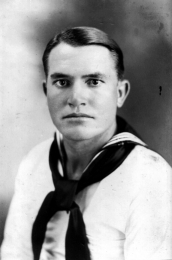 Grafton Clyde Thornton served on the USS West Virginia from May 2, 1931, to August 4, 1933. Of all the time he spent on ships during his long Navy career, he spent his longest tour on the USS West Virginia. On board the Wee-Vee, he was a Seaman First Class rate. Upon leaving the ship, he became Boatswain's Mate First Class. Next, he went to the USS Lexington CV-2, where he saw action in the Battle of the Coral Sea and the Lex was sunk. He eventually went on to become a Chief Boatswain's Mate before retiring from the U.S. Navy. Grafton was born in the small farm town of Tupelo, Arkansas. He died in 1969 at Bethesda Naval Hospital and is buried near McCrory, Arkansas.